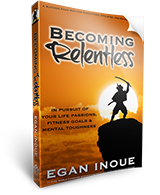 Join our Newsletter & get a free chapter from "Becoming Relentless"
Egan Inoue is an author, professional keynote speaker and world champion in 3 sports. He won his first title in racquetball in 1986. He traveled on the pro circuit for the next four years and went on to become a two time world champion when he won again in 1990. He started a racquet company that year called E-Force. 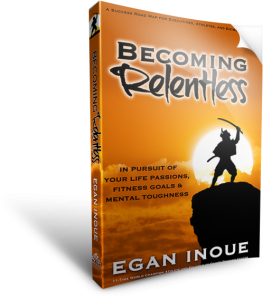 Then in 1993, Egan left the world of racquetball to focus on his interest in artial arts. In 1996, he became the first non-Brazilian to win a Brazilian Jiu Jitsu world title. He won multiple world titles in Jiu Jitsu before moving on to mixed martial arts. He had a successful career with five world championship titles. In 2003 he retired from professional sports ot concentrate on his main priorities, his family. Today, he owns a fitness company with three gyms on Oahu, a Cryotherapy business and an online coaching program.